These manual dish washing and sanitizing chemicals are available in liquid, powder, or solid form. Use a presoakser in the first well of your three compartment sink, a detergent in the second, and a sanitizer in the third. These three steps will remove caked-on food and sauce, while also killing any harmful germs and contaminants. 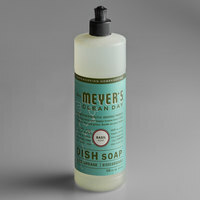 You can even check out our eco-friendly dish washing soap options for use in your environmentally-friendly establishment. Also make sure to check out other great items from Advantage Chemicals, Noble Chemical, Bar Keepers Friend, Mrs. Meyer's and Pure Bright. We carry manual dish washing and sanitizing chemicals to tackle any type of dish in your kitchen that’s not safe for use in a commercial dishwasher. By having a supply of these chemicals in stock, you’ll be able to keep elegant dinnerware, utensils, cutting boards, pots, pans, and other hand-wash only tools shiny and clean. Best of all, these detergents and chemicals are sold in bulk supplies, so you don’t have to worry about reordering as often! For more great products that will help your staff collect dirty dishes, check out our bus tubs, flatware holders, and transport carts. 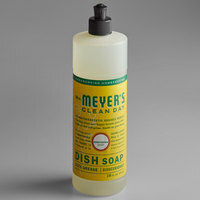 If you're wondering where to buy mrs. meyer&apos;s manual dish washing & sanitizing chemicals, we have a large selection of mrs. meyer&apos;s manual dish washing & sanitizing chemicals for sale at the lowest prices.